Dealing with pet waste is never a pleasant job, which is why we’ve introduced solutions for cats and dogs that involve minimum maintenance but maximum results. 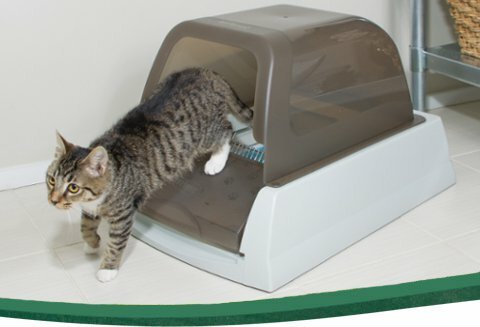 The ScoopFree™ litter box is a cleaner alternative that’s more hygienic than the traditional, manual ‘clog and clump’ trays. Just think…you’ll never have to scoop again! And for dogs, there’s the Pet Loo™ pet toilet, a convenient and simple product for both you and your pet with a unique urine drainage system that makes it one of the most hygienic house training solutions available. 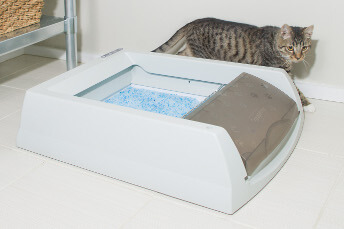 Banish cat waste odour forever with this clever, self-cleaning litter tray. Toilet train and clean up after your dog in no time with the Pet Loo™ indoor toilet and pet cleaning supplies. Which Litter Box Is Best for You & Your Cat? Privacy hood gives cats the extra privacy they deserve whilst keeping the litter properly contained. Adjustable rake delay allows you to choose whether the automatic rake sweeps 5, 10 or 20 minutes after use. Health counter tracks the frequency of use so you can monitor your cat’s health. The Pet Loo™ portable toilet for dogs, cats, and small pets is an alternative to pee pads, bathroom breaks, and litter boxes. Ideal for apartments, toilet training and occasions when you can’t let your pet out, the Pet Loo™ gives your pet a bathroom anywhere he needs it. Place the Pet Loo™ anywhere inside or outside. Your pet stands on the Pet Loo™. The reinforced base can easily support your pet's weight. When your pet pees on the Pet Loo™, the urine drains through small holes in the synthetic grass. Urine trickles down through the grass into the catchment jug. The special powder in the Pee Pod™ solidifies urine into a gel. Less odour, less mess! Remove the catchment jug and pour the urine into your toilet or garden. When your pet poops on the Pet Loo™, simply scoop up as you would in a normal back garden! The optional Pee-Pod™ Urine Disposal Kit is a biodegradable container that fits neatly inside the Pet Loo™. Sprinkle Wee Sponge™ powder in the Pee-Pod™. When the powder comes in contact with urine, it rapidly absorbs the urine and turns it into a solidified gel, trapping any airborne odours. When the gel is thrown out, so are the odours. Together, the Wee Sponge and Pee-Pod™ allow the Pet Loo™ to hold at least 100 times its weight in liquid! Even housetrained pets have accidents occasionally. Our pet cleaning products use trillions of natural broad spectrum enzymes to remove the source of the smell, so your pet won’t keep marking the same spot. While other cleaners simply mask the smell, our cleaners break down pet stains and odours entirely. Prevent urine damage and burn patches on your lawn by adding one Lawn Protector™ pouch to your pet’s water bowl. The natural ingredients filter the drinking water and neutralise the nitrogen in your pet’s urine. Have questions about these products? Wondering what kind of litter to use or how many cats per box?